Correction: due to a bug in the CodoLab platform, the final score of the two finalists was incorrectly calculated. More specifically, one of the final submissions hung, i.e. did not succeed or fail. We ran it as soon as we noticed and the results changed the final score significantly. We thus immediately contacted the two finalists Dave and Philip since the corrected scores place Philip in first place. Both Philip and Dave were very gracious in their response to this and we are very grateful for their kind understanding. Please help us congratulate Philip for a phenomenal top score! Aerial imagery make for the highest resolution maps possible. Increasingly larger areas can be covered using small commercial mapping drones. Academic research has shown that trained analysts will take around one minute to analyze a single high-resolution image. Manually analyzing 800 images from a 20-minute flight can therefore take 13 hours. As such, aerial imagery is quickly becoming a Big Data problem. This explains why we launched the Open AI Tanzania Challenge in partnership with our friends at the State University of Zanzibar (SUZA), Open Data for Resilience Initiative (OpenDRI) at the World Bank, OpenAerialMap and Tanzania Flying Labs. We want to express our sincerest thanks and deep appreciation to Dr Muhammad Juma, Director of Urban Planning, the Commision for Land (COLA), SUZA and Spatial Collective for making the data available and for supporting Open AI Tanzania and the Zanzibar Mapping Initiative (ZMI) for creating the unique drone dataset over Zanzibar used in the challenge (more information on the project follow this link). We are equally grateful to Jordan Yap and David Lindenbaum for moderating the challenge and evaluating the results. For information on our previous Open AI Challenge in the South Pacific, please follow this link. Participants were given a set of very high resolution images collected with drones over the island on Unguja. The challenge required identifying and classifying all building footprints into one of three construction status classes: foundation, unfinished and completed. The evaluation criteria was based of the SpaceNet metric which is scored from 0 to 1 with 1 being perfect. To learn more about the metric visit the challenge website. A total of 126 individuals participated in Open AI Tanzania, including numerous African data scientists that were connected to this challenge by our friends from Black in AI and DataKind. The two winning finalists were formally announced today at the Experts Meeting on Aerial AI in Geneva, Switzerland. First place goes to Dave Luo from Anthropocene Labs who had an overall score of 0.697 on the final dataset, and in second place Philip Popien from Vexcel with a score of 0.690. Thanks to Dave and our partner, Picterra, Dave’s winning classifier will be made available for all to use via the Picterra platform. In the meantime, you can access the results of Dave’s classifier here. On behalf of the State University of Zanzibar (SUZA), OpenAerialMap, World Bank and Tanzania, Flying Labs, we express our sincerest thanks to all 126 participants who actively participated in this challenge. 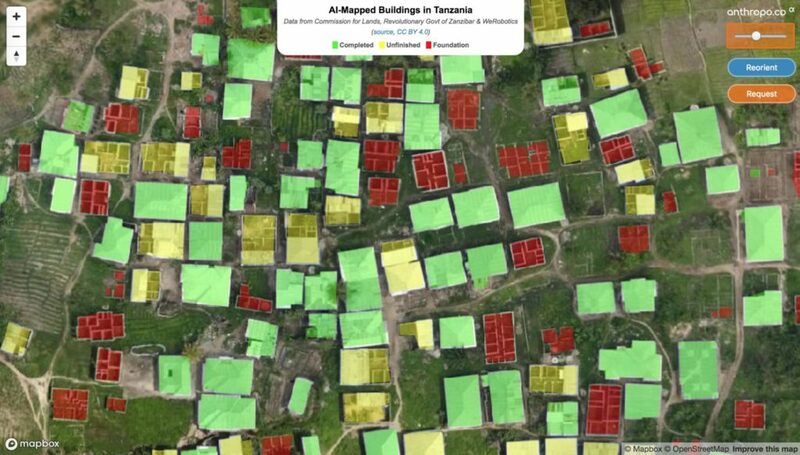 SUZA, Tanzania Flying Labs, the Commission for Land Planning and other Tanzanian organizations will now be able to use the results of the Open AI Tanzania Challenge to directly support their good work.